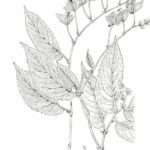 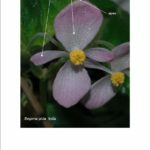 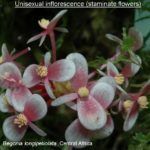 Instead of looking all botanical characters of inflorescences and flowers of genus Begonia plants, I think it would be sensible and less tedious to describe in detail some typical infloresecnces of this very large genus ; specific vocabulary will be explained in this first page and illustrated with photos. 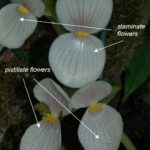 staminate flowers and pistillate flowers are always distinct. 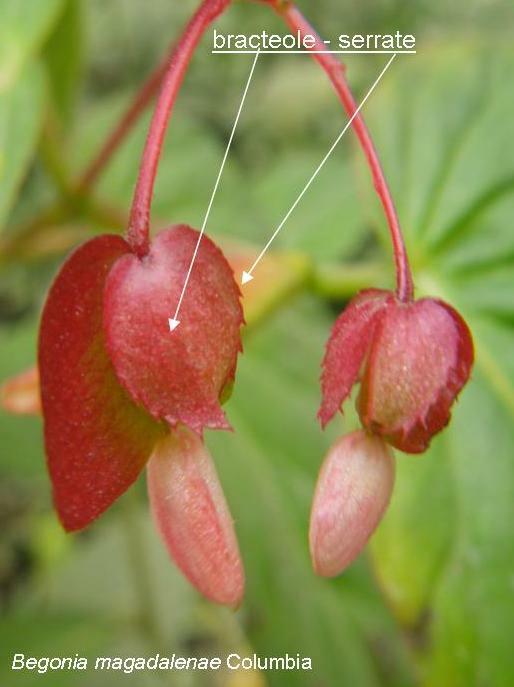 axillary inflorescence : inflorescence which starts from a leaf insertion. 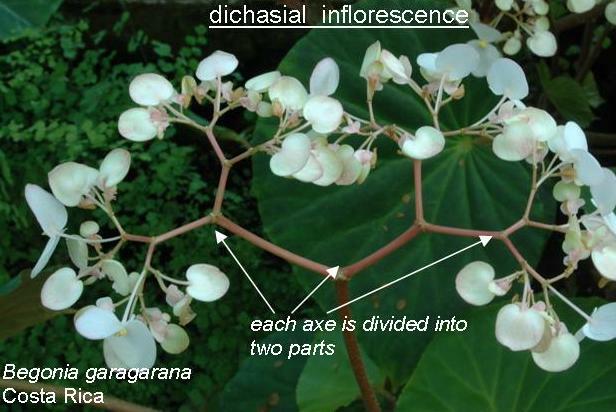 monochasial inflorescence : an inflorescence is monochasial if all axes end by only a flower. 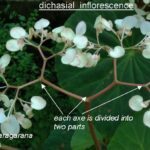 dichasial inflorescence : an inflorescence is dichasial if each axis is divided into two opposite axes. 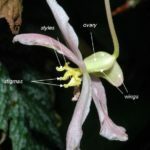 raceme : an inflorescence is a raceme if the pedicels of flowers are fixed at differents levels on the peduncle, the older at the base. 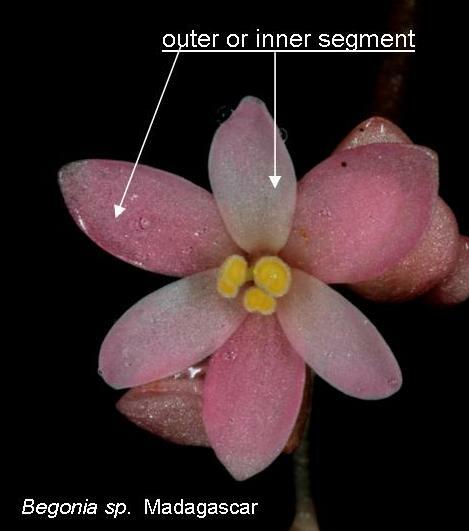 paucifloral inflorescence : inflorescence with few flowers. 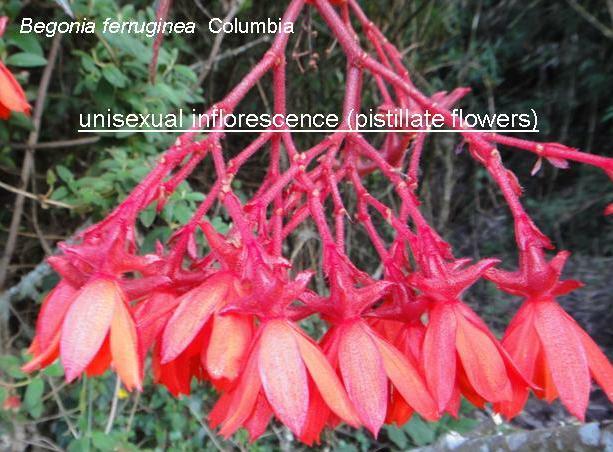 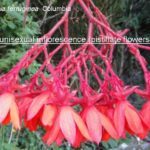 bisexual inflorescence : one inflorescence which has staminate flowers and pistillate flowers. 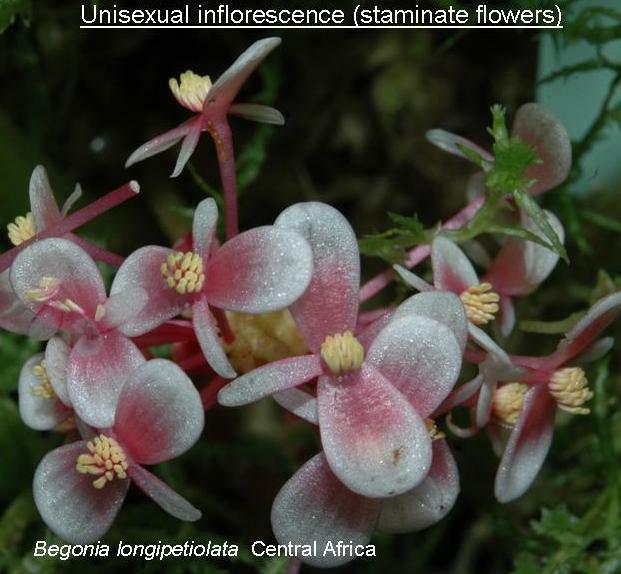 unisexual inflorescence : an inflorescence which has staminate flowers or pistillate flowers. 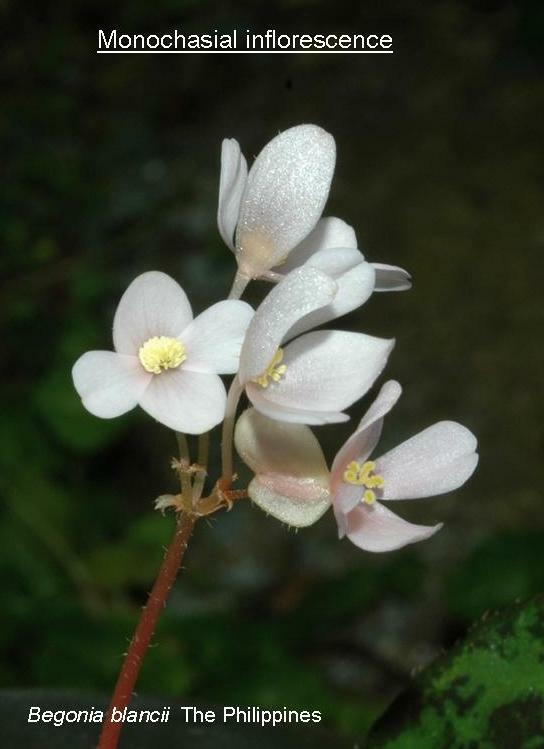 dioecious plant : staminate flowers and pistillate flowers are on different plants. 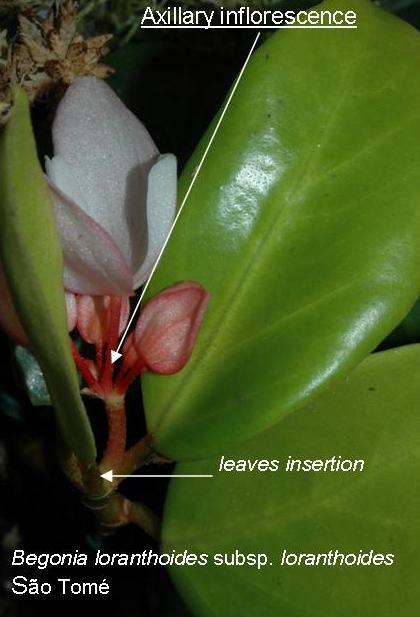 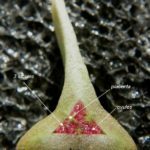 bract : a more or less modified leaf subtending an axis ; it protects the inflorescence before opening. 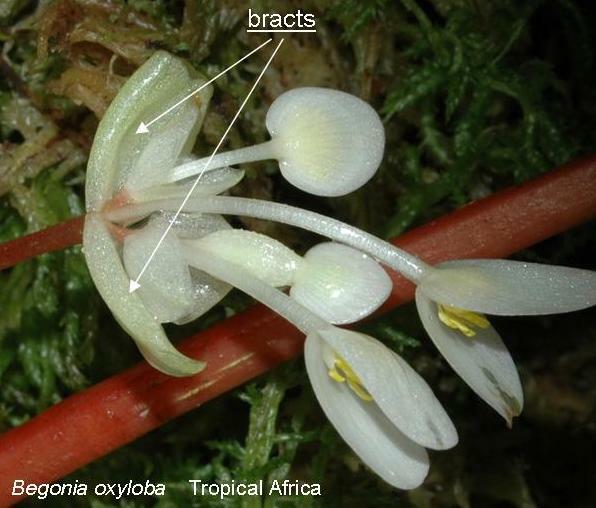 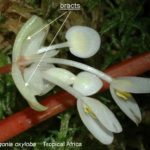 bracteole : small bract on a pedicel of a pistillate flower, between bracts and flower. 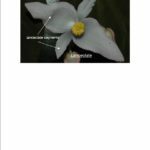 pedicels : axes which bear each flower. 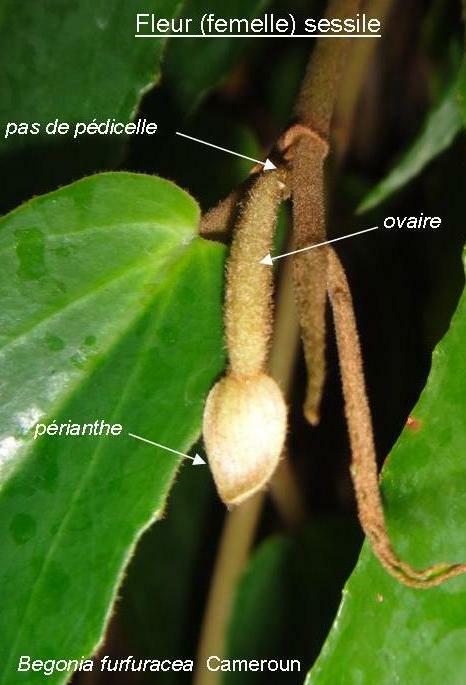 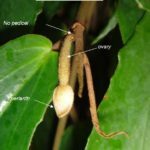 peduncle : the axis which bears the inflorescence. 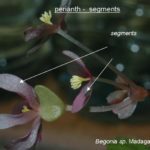 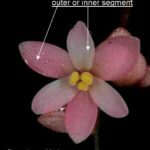 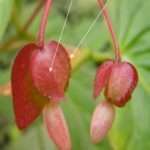 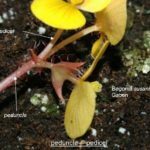 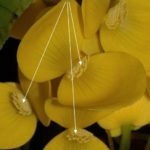 segments : in genus Begonia it is difficult to distinguish sepals and petals ; however, they are different ; so, it is better to use the word segments (rather than tepals which makes us think they are identical) ; there are outer segments and inner ones, according to their tendril. 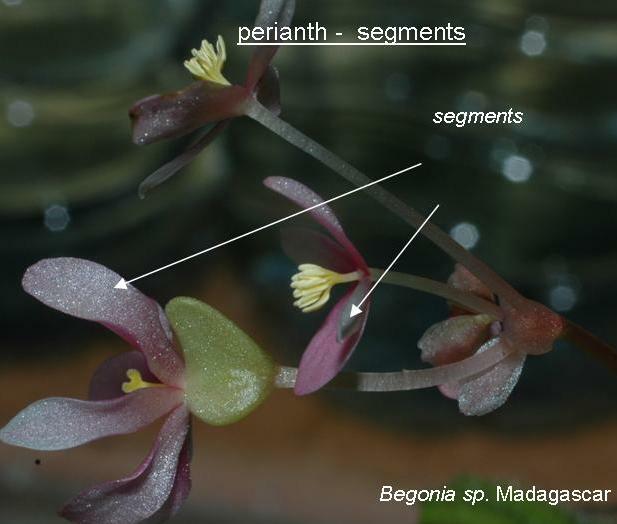 perianth : the whole of segments of a flower. 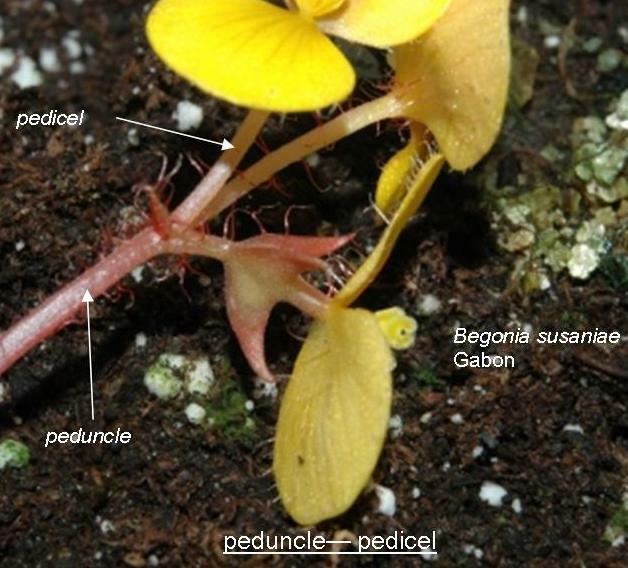 sessile : a flower without peduncle or pedicel. 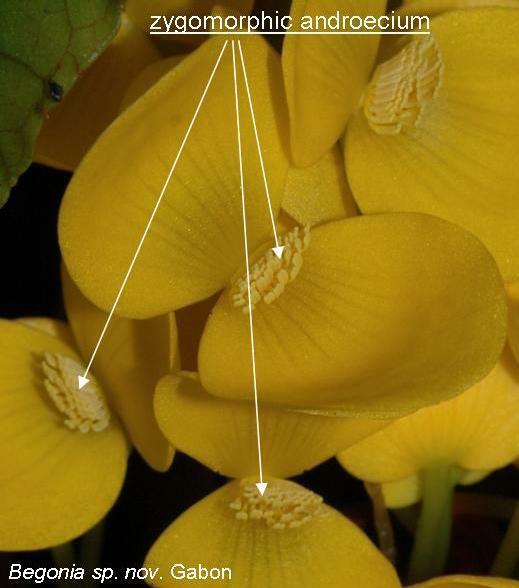 protogyne : inflorescence which pistillate flowers are receptive before stamens shed pollen. 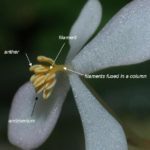 staminate flower : stamen / anther / pollinic bag / filament / connective : a stamen is an organ of the mâle flower where the pollen is produced ; it is made up of anther which contains pollinic bags where is the pollen and of the filament which bears anther ; the tissue which connects pollinic bags is connective. 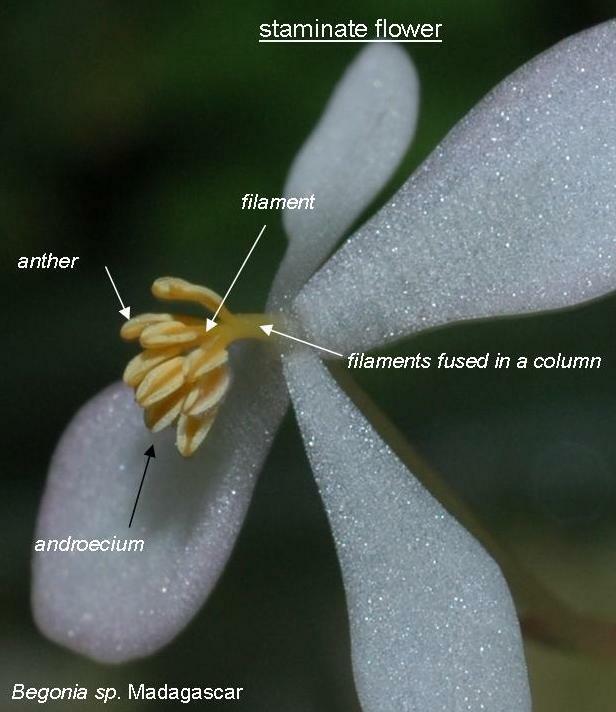 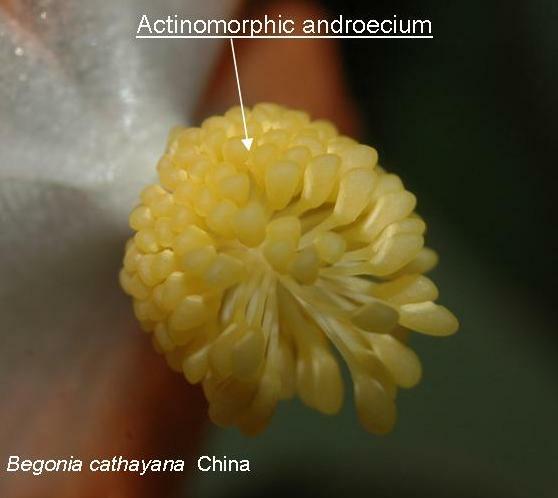 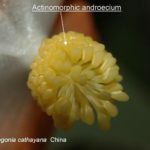 androecium : the whole of stamens. 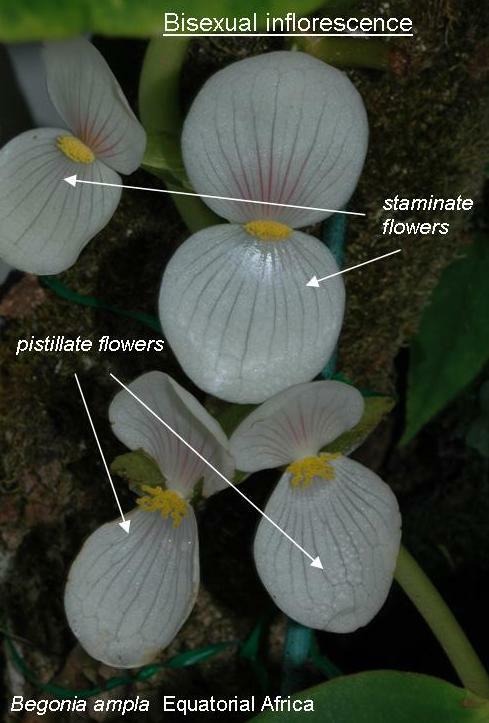 pistil : the whole of female elements of a (pistillate) flower : it is made up of ovary and styles which bear stigmas. 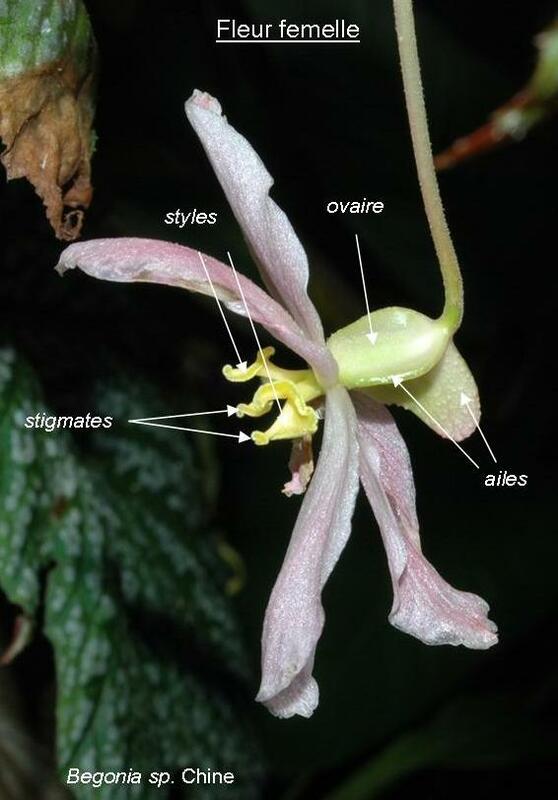 styles : part of the ovary which bears stigmas. 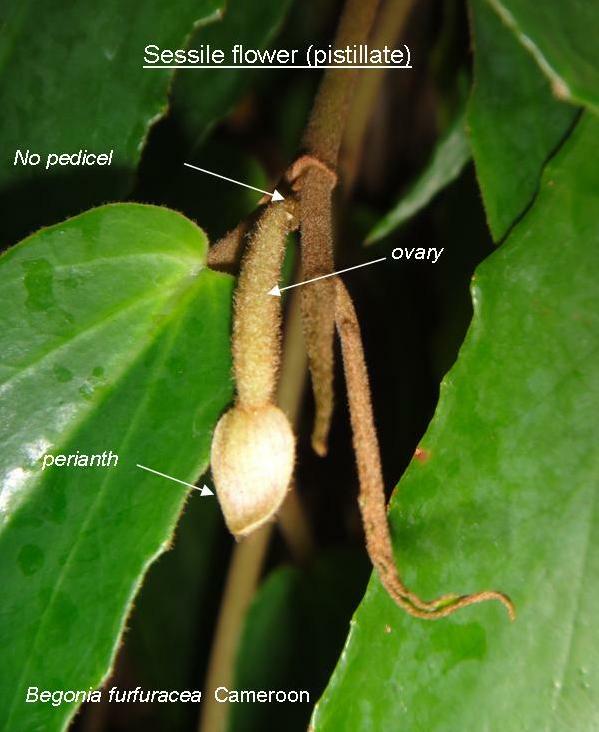 ovary / locules / ovules : the ovary is the hollow part of the pistil which is made up of several locules which contains ovules. 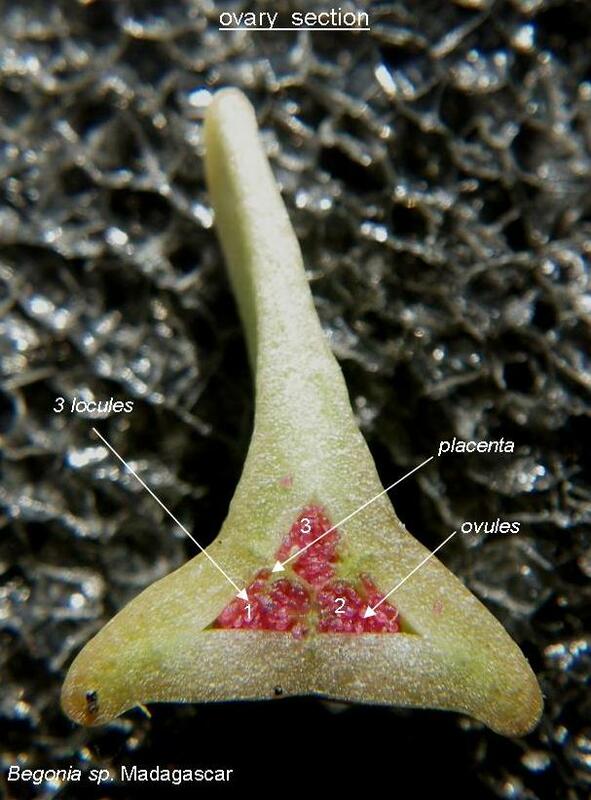 placenta : wall ovary thickening which bears ovules (the placenta form and the ovules position are very varied). 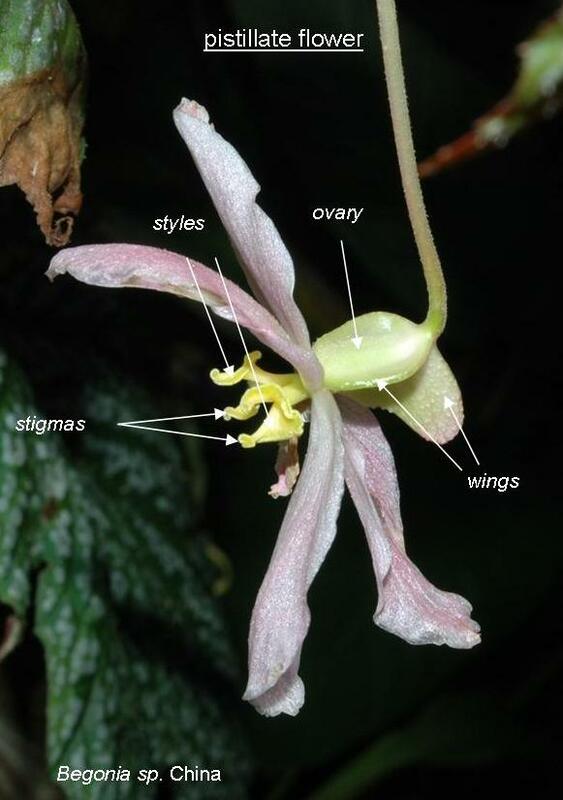 wings : outer ovary appendages more or less spread out. 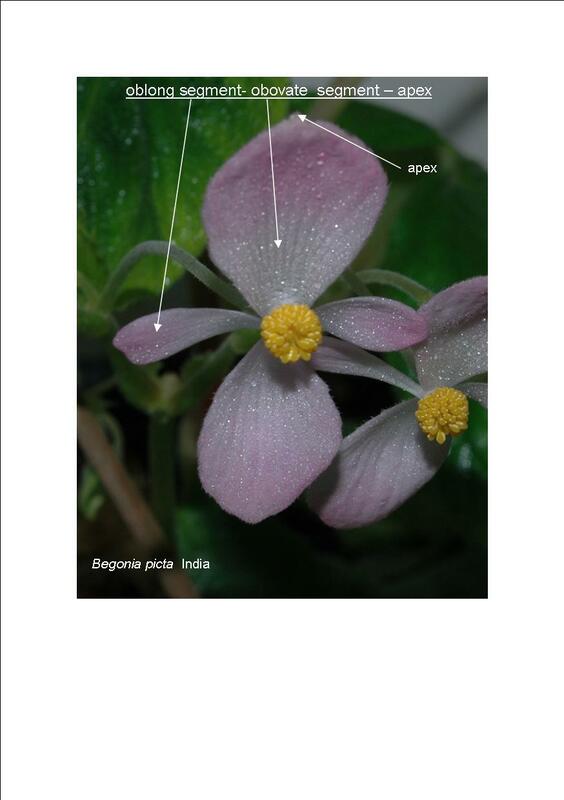 apical : which is at the extremity or at the top. 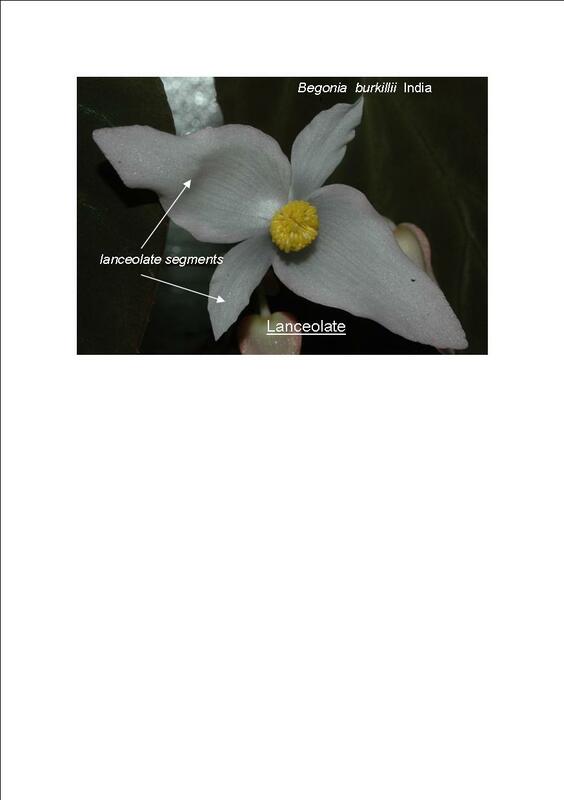 lancolate : spear-shaped, elongated and sharp, the less wide part at the base. 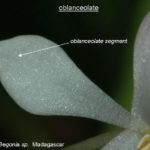 oblanceolate : lanceolate, the wider part at the top. 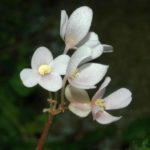 oblong : more longer than wide. 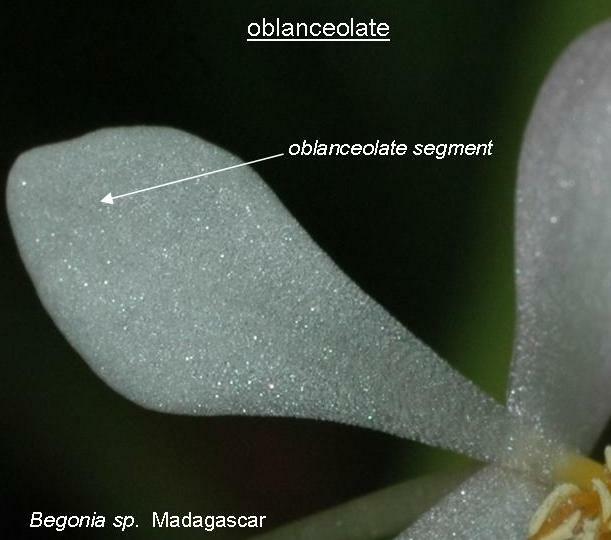 obovate : egg-shaped, the more narrow part at the base. 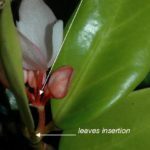 déhiscence : anther or fruit opening ; the opening way of these organs. 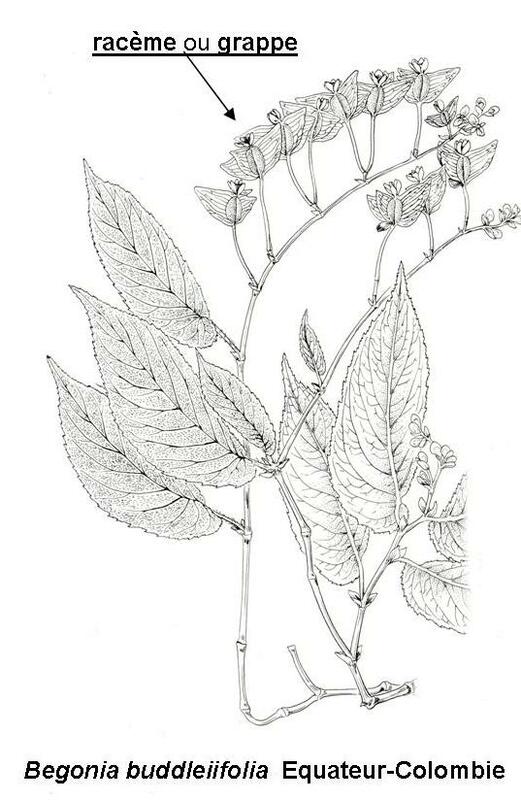 serrate : with small, sharp and oblique teeth to the margin, as a saw.